The closet reno that was recently chronicled over here, actually only involved 2/3 of our closet- and left a big wall blank in the middle. I kind of liked the possibility of what we could do with this large expanse of blank space. We were flirting with the idea of hanging a large mirror, or maybe even doing an art piece that would incorporate the wall color a bit. But then, IKEA happened. ...and then we remembered that big empty space in our closet. 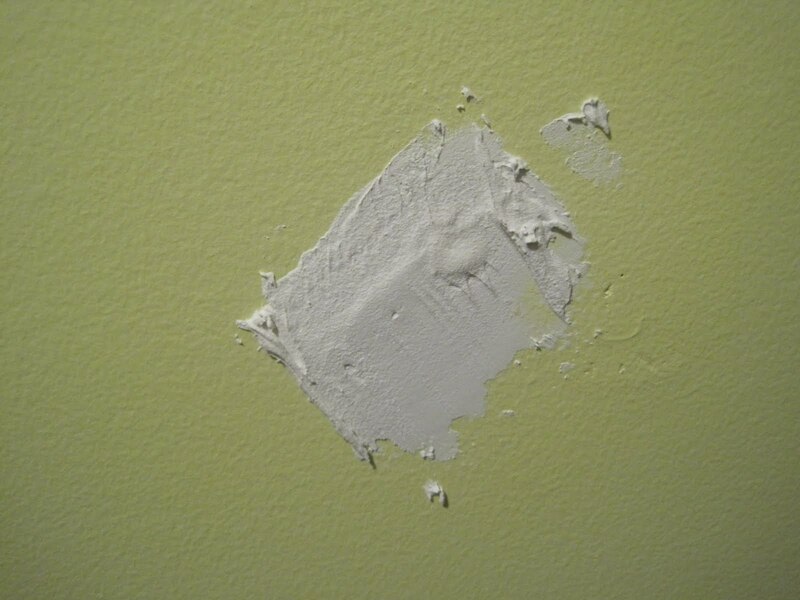 The white popped just as well against the grellow paint. And could serve as a unit to house towels and linens. There you have it- problem solved! After a bit of research, we attempted to mount the shelf. Here's a disclaimer: In our home we have wall mounted many objects over the past few months, and it's always a bumpy road. Our walls hate us. Literally. We always have anchors snap off and break, or our stud finder lies to us and we end up in drywall only, or the drill won't work- there's always something. And this experience really pushed me over the edge. I learned that the best way to wall mount a heavy item (in drywall) was to use toggle bolts. And I snapped some up, and anticipated to mount 4 toggle bolts, and then the shelf, and we'd be laughing. We held our breath and mounted toggle bolt number one. It went in effortlessly *phew*. We mounted toggle bolt #2. It only went 1 1/2" in... turns out there was a stud there. Which, is a blessing in disguise, as I've learned mounting into studs is the most desirable way to hang something. I grabbed my 3" wood screws, and we got to work... they only went 2" in (I've since discovered that 3" wood screws are too long). We moved on to the next toggle bolt (directly below the first)- for whatever reason, it spun in place. Frustrated, we went on to the final screw (into the stud, presumably, as it was directly below the stud wood screw)...and it went straight into drywall and spun.... the screw rubbed against the stud, and missed it!! AHHHHHH! Sheer frustration at this point, and I was about to throw my arms in the air and give up, but I couldn't lift them anymore after holding this beast up for 20 mins. We painfully decided to take out all the screws, and move the shelf over to hit the center of the stud on the one side. Which meant more drywall patching and painting. This experience really deterred the rest of the closet reno. I desperately lacked motivation for weeks to finish the project, as I felt useless to accomplish it. 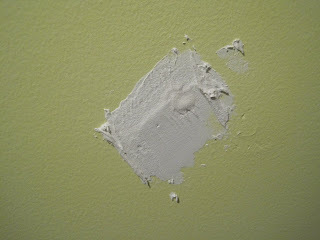 And so, for several weeks, the wall remained untouched with white, unpainted drywall compound, just waiting to be sanded. 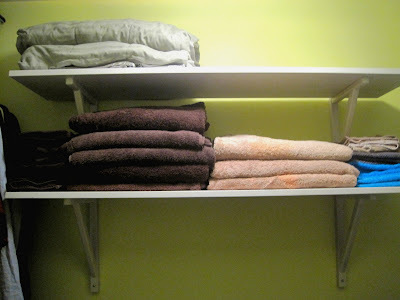 The final purpose of these beastly shelves is to hold our towels and linens. I know.. all this fuss for some fabric and textiles. 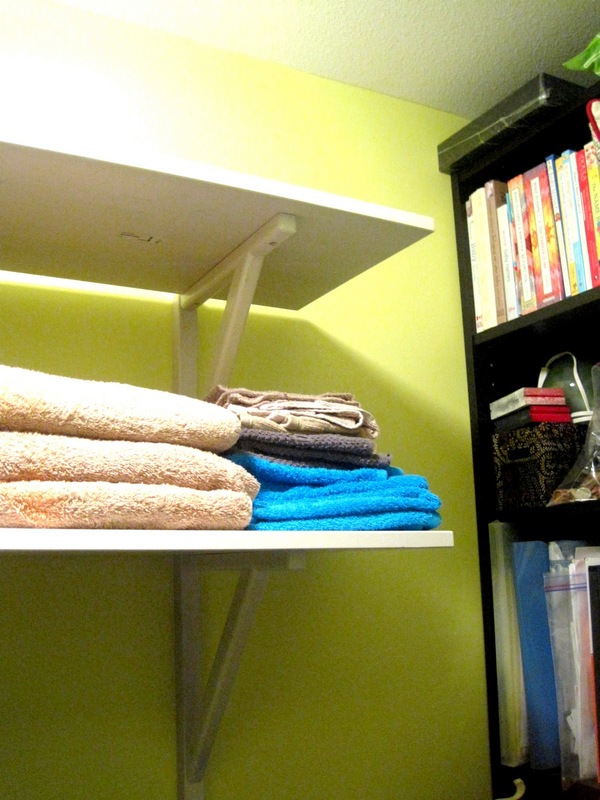 But, in a small apartment, every inch counts- and your towels have to go somewhere! Most of all, I'm just happy to have them up and out of the way. And, it feels amazing to cross another thing off the neverending checklist!